Hamah is another enormously old place. There was some settlement here going back to the Neolithic. The archaeologists have had a hard time dating it to any precision given its generalized stratigraphy. In simple terms, you can't tell the layers apart. But the location may have been occupied back around 6000–5000 BC. The Amorites came from Mari on the Euphrates to colonize the area in the 2000s BC. By about 1500 BC it was very prosperous. Then the Hittites, ruling from their capital at Hatuşaş at today's village of Boğazkale in Turkey, defeated the Egyptian army of Ramses II near here in about 1285 BC. This area was part of the Hittite Empire until it faded, and the Assyrians came in. By 1000 BC the place had its name of Hamath. Then Assyrian power faded and the nomadic Aramaean people moved into the area from the Syrian desert. It was one of the more powerful Aramaean states, the most powerful of which was Damascus. By 540 BC it was part of the Persian Empire. Then it was pretty much the same story as Aleppo — Alexander the Great and Greek rule, then Roman, then the Arab conquest in 638 or 639 AD, Crusaders from the west, Mongols from the east, Mamluks out of Cairo, then absorption into the Ottoman Empire in 1516. About four centuries of Ottoman stability, then World War I, the French Mandate into World War II, and now modern Syria. If your browser is Unicode-impaired, "Ḩ" is supposed to be a capital "H" with a cedilla or hook underneath, it's Unicode &#x1e28;. The big thing to see in Hamah are the norias, the large wooden waterwheels. There are 17 norias dating back to Byzantine times. Well, the stone water channels and the design and location go back to the Byzantines, the wooden parts have been replaced from time to time. The largest noria is 20 meters in diameter. 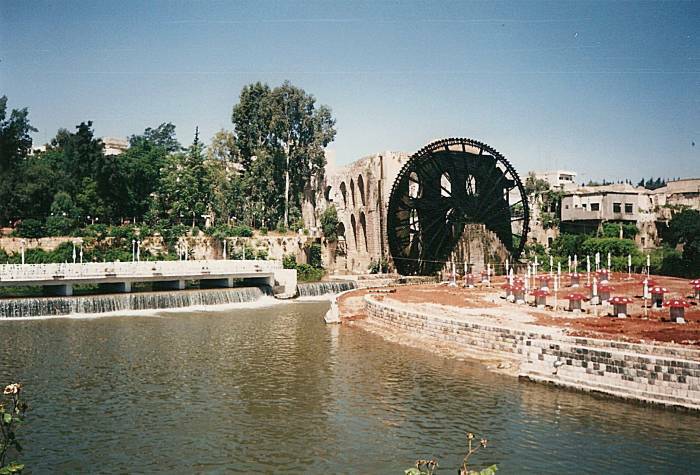 Waterwheels or norias in Aleppo. I hardly have any Hamah pictures, so here is some Syrian pocket litter. Two bus tickets and a business card. In Hamah the Cairo Hotel is a great place to stay. It's on Kouwatli Avenue just west of Jamal Abdel Nasser Street. It's a block and a half from the river, where you can see the above waterwheel. It was just 100 S£ (US$ 2.50) for a bed in a shared room, or 400 S£ (US$ 10) for a double. Go left out the door to the end of the street and you find one of the best falafel stands anywhere, right next to the only place to buy alcohol in Hamah. 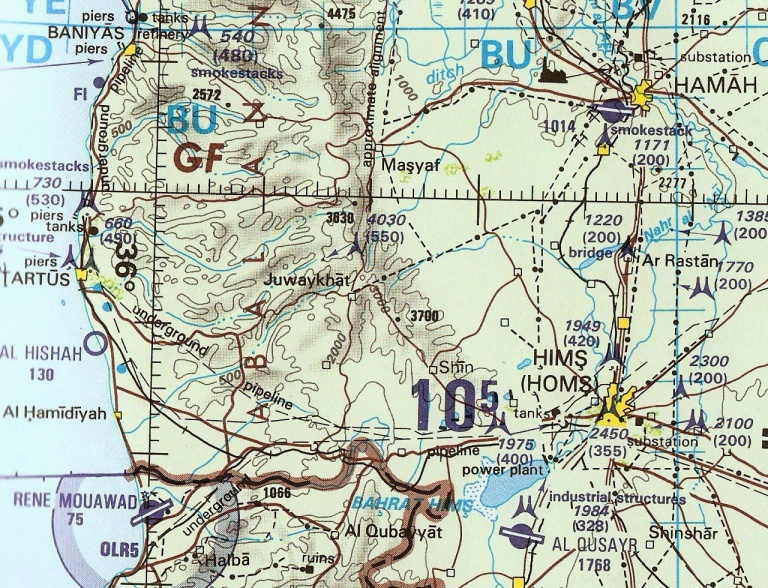 A U.S. Government map showing Hamah, Himş and the coast. Take the road straight west from Himş, turn north toward Juwaykhat just over half-way to the coast, and Qala'at al-Hişn village is the unmarked square next to the marked 2000-foot elevation line. I suppose that I have briefly been in Lebanon twice, at least officially. But there's no sign of where that road crosses what's a fairly meaningless border between Syria and Syria-controlled northern Lebanon. 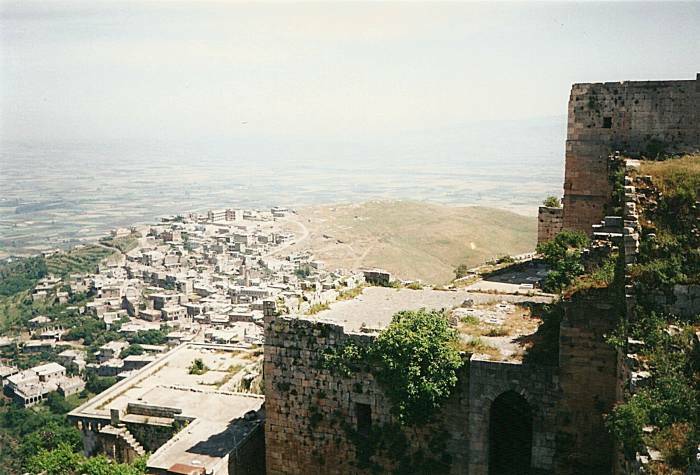 A view south from Krac des Chevaliers toward the northern mountains of Lebanon. Krak des Chevaliers is a huge Crusader castle. It's west of Himş, between there and Tartūs on the Mediterranean coast, just barely north of the Lebanese border. It makes a nice day trip via minibus. The friendly folks at the Cairo can help you figure out transport there and back. It's a short ride on the main highway to Himş. Himş, or Ḩimş, also gets spelled Homş and Homs. Welcome to the many competing approximate transliteration schemes for spelling Arabic names with Latin characters. In Himş you change to a minibus to Qala'at al-Hişn, the village at the base of the fortress and the Arabic name for the fortress itself. Krak des Chevaliers is in a combination of languages. 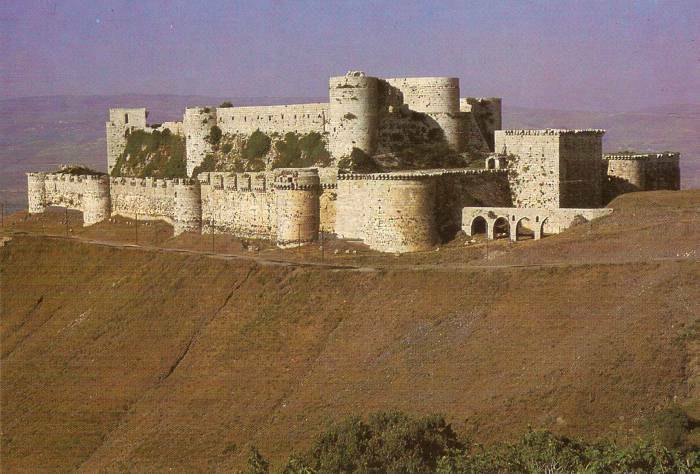 Krak from the ancient Syriac karak, meaning fortress, and des chevaliers being French for of the knights. The fortress is on a 650 meter high hill overlooking the intersection of two important routes: the north-south road from Antioch to Beirut, and the east-west route from the Mediterranean coast to the interior. It was one fortress in a network of defenses of the Crusader states, and is one of the world's best preserved and largest medieval military castles. The original fortress on the site was built in 1031 for the Emir of Aleppo. It was captured in 1099 in the First Crusade, and then abandoned as the Crusaders marched on toward Jerusalem. It was recaptured by the Crusaders in 1110, and it 1142 it was turned over to the Knights Hospitaliers. It was their headquarters throughout the Crusades, and they expanded it between 1150 and 1250. The inner curtain wall is up to 30 meters thick at the base and has seven guard towers almost 10 meters in diameter. The Hospitaliers added an outer wall three meters thick. The castle housed a garrison of 2,000 men, and the inner courtyard had a 120 meter long storage facility and stables holding up to 1,000 horses. Storage facilities dug below the fortress provided supplies that could have supported the garrison through a siege of five years. A postcard of Krac des Chevaliers. Not that the Arab forces didn't try, and eventually succeed. It was besieged by Nur ad-Din in 1163, and Saladin in 1188. It was finally taken by the Mamluk Sultan Baibars in April of 1271, after he brought in some heavy trebuchets. Why does so much of Hamah and even more of Homs look like there was wide-spread demolition that never got cleaned up? Hamah and Homs have been, by Syrian standards, religiously conservative places. If you wanted to find religious hot-heads in Syria, this was the area to look. In addition to that, they had seen a pattern of unrest related to class conflict, land owners versus agricultural workers. 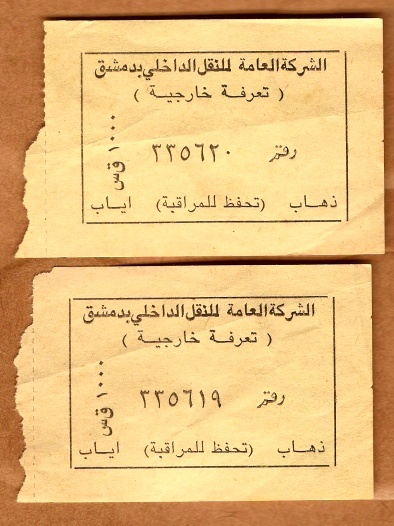 Starting in the spring of 1964, preachers in some of the mosques of Homs and Hamah encouraged revolts against the Ba'ath party. Then, in the late 1970s, a Sunni Islamist movement was growing and becoming more openly opposed to what was by then the regime of Hefez al-Assad. It was a Syrian branch of the Muslim Brotherhood, something like Al-Jama'ah Al-Islamiyyah or Hizb Al-Ikhwan Al-Muslimoon. They had political complaints, and being hard-line Sunnis they thought that al-Assad was a heretic as he's a member of the Alawite sect. 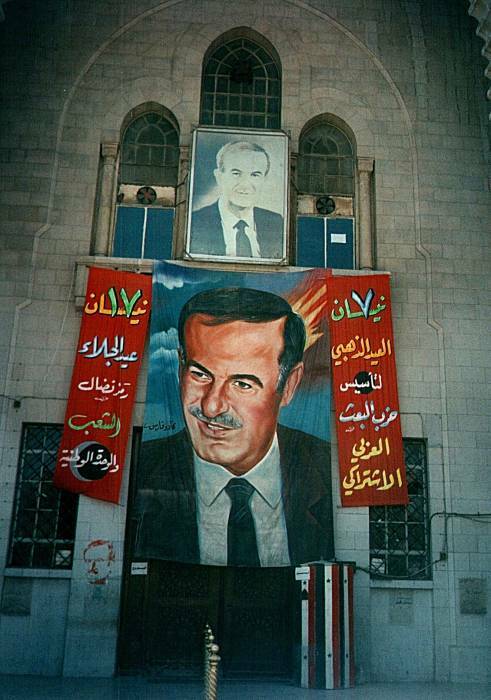 Poster of Hefez al-Assad in Damascus. Things gradually escalated in the late 1970s, with the Muslim Brotherhood killing a mostly Alawite group of eighty-three military cadets, and killing several hundred people in a series of three car bomb attacks in Damascus. The government pushed back with mass arrests, abusive tactics, and torture of Muslim Brotherhood prisoners. In June 1980 the Muslim Brotherhood very nearly assassinated al-Assad in an attack with grenades and machine guns. Within hours troops led by al-Assad's brother Rifaat, his Defense Minister, killed a large group (from several hundred to one thousand) of Islamists being held at Tadmor Prison, near Palmyra. That led, unsurprisingly, to calls from the Muslim Brotherhood for revenge, and an increase in bombings. 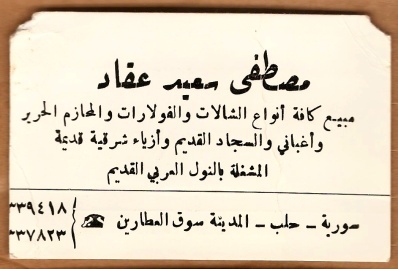 In February 1982 there was an uprising in Hamah, and the Islamists proclaimed that Hamah was a "liberated city" while urging all Syrians to rise up against "the infidel" al-Assad. That pushed things over the edge. Hefez al-Assad had his brother Rifaat, his Defense Minister, put the revolt down with military force. The population was given a short notice to evacuate, anyone remaining would be considered a rebel target. The air force then dropped bombs to open entry for armored vehicles to enter through the narrow streets. Artillery shelled the city over a period of three weeks. Then Rifaat's special forces and Mukhabarat agents went in to search for surviving Muslim Brothers and "supporters". This ended the uprising. The government forces are alleged to have executed thousands of prisoners and civilian residents. There don't seem to be reliable figures on the number of people killed, the most reliable estimates range from 5,000 to 20,000. The cities still showed the effects in places when I visited. Bulldozers had been used to level large areas, including most of the old city, so while Hamah and Homs had been occupied for ages it doesn't appear to be an old city. They were still being rebuilt in bits and pieces, very slowly. With the public fear of the ruthless government, and with this episode being extremely sensitive and the story surpressed in Syria, the local attitude is "Destruction? What destruction? ", as they clamber over piles of rubble. Of course, that was pretty much the end of the Syrian branch of the Muslim Brotherhood. The Egyptian branch of that organization went on to become al-Qaeda — unfortunately, al-Assad didn't get them all. There's more detail on the Wikipedia page. Thomas Friedman's book "From Beirut to Jerusalem" has a whole chapter on this. Hamah and Homs were centers of anti-government unrest through 2011 and into 2012, following the more successful movements leading to government overthrows in Tunisia and Egypt. Protests began in January, and grew much larger in scale in March, 2011. More than 2,000 protesters had been killed by early August of that year. By the end of 2011 and into 2012, the government was shelling its own cities with artillery. Once again, the Syrian government sent its armored vehicles against its own population. The government made some vague claims about "saboteurs" and other provacateurs and trouble-makers supposedly from outside the country. See the Wikipedia articles describing the uprising and its detailed timeline. You can read about the 2011-2012 Siege of Homs and in particular the Syrian military's artillery bombardment of the city.